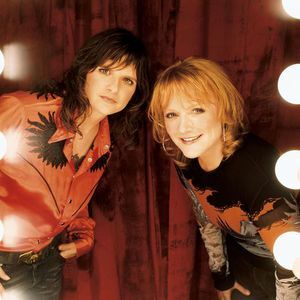 The Indigo Girls are Amy Ray and Emily Saliers. They met on the playground in grammar school in Decatur, Georgia, USA, and have been playing together since high school. Their first release in 1985 was a seven-inch single named "Crazy Game", with the B-side "Everybody's Waiting (for Someone to Come Home)". That same year, the Indigo Girls released a six-track Extended play album named "Indigo Girls", and in 1987 released their first full-length album, Strange Fire, recorded at John Keane Studio in Athens, Georgia, and including "Crazy Game". Their first release in 1985 was a seven-inch single named "Crazy Game", with the B-side "Everybody's Waiting (for Someone to Come Home)". That same year, the Indigo Girls released a six-track Extended play album named "Indigo Girls", and in 1987 released their first full-length album, Strange Fire, recorded at John Keane Studio in Athens, Georgia, and including "Crazy Game". With this release, they secured the services of Russell Carter, who remains their manager to the present; they had first approached him when the EP album was released, but he told them their songs were "immature" and they were not likely to get a record deal. They were signed to Epic Records in 1989 and won the Grammy for best contemporary folk album later that year (for their self titled release) Some of their hit songs include "Galileo," "Closer to Fine," and "Shame on You." Aside from being musicians, Ray and Saliers are activists, constantly supporting causes like gun control, women's rights, Native American rights, environmental protection, the abolition of the death penalty, and as lesbians themselves, LGBT rights. They constantly devote their time and money to such causes, often playing benefit concerts. Ray and Saliers both have side projects. Ray owns and founded Daemon Records, an independent label based in Decatur. She also has a career as a solo artist, and has released two albums thus far. Saliers is the part owner of Watershed, a restaurant and wine bar in Decatur. Together, the Indigo Girls are constantly touring. Their new album, Poseidon and the Bitter Bug, was released March 24, 2009.